100% Bonus Depreciation. It’s not so simple as deducting everything—the Handbook explains what qualifies and how to decide between expensing versus capitalizing, bonus depreciation and Section 179 expensing. Increase Section 179 Limits. While 100% bonus depreciation is dominating the cost recovery headlines, the Handbook explains situations that call for using the Section 179 deduction—which is available up to a historically large limit and for newly broadened types of qualified property. Like-Kind Exchanges and Form 4797. Like-kind exchanges are now allowed only for certain real property—meaning many more transactions will be reported as taxable on Form 4797, including traditionally tax-free vehicle trade-ins. The Handbook show you how to comply. 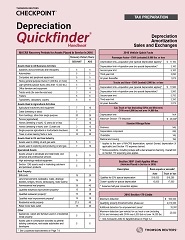 The Depreciation Quickfinder Handbook is your trusted source for quick reference solutions to help you determine the right recovery period, compute the right amount of depreciation, decide whether expenses need to be capitalized, manage the special rules for autos and other listed property, claim the Section 179 and bonus depreciation deductions, correct depreciation errors, work with like-kind exchanges and involuntary conversions, and simplify a host of other complex tax issues. It provides quick answers to all your business property questions in a concise, easy-to-use format.